Alison had another good day of hard work. She started by getting her first shower in a while, and after being woken up by some pesky respiratory folks, she was doing a lot better afterwards. So from about 9:30am–4:30pm she was out of bed and in her chair. First up was physical and occupational therapies where they took her to stand up again. And today she doubled her time from yesterday and was on her feet for 18 minutes. Even though she requires almost total assistance to stand, supporting her own weight helps develop the muscle tone needed for future progress. After that she had individual therapies until after 3pm, and we even took her down to a courtyard and looked at some pretty flowers and got a little sun. They also capped her trach completely for most of today. That's a pretty big deal which means she was breathing 100% on her own. They just came by to remove the cap and give her a break for the night. But her breathing continues to be really good. They did start her on an antibiotic tonight to treat a UTI, but that's not too worrisome. But since her medical condition has improved so much (breathing, infections, fever, heart rate, etc. ), they feel it may prove difficult to keep her in the LTACH much longer. So we've been discussing the different level of care options from here. Most likely we'd try to go to Madonna's Transitional Care Unit (TCU - skilled nursing), but we'll see how the review with the insurance company goes on Tuesday and go from there. My mom arrived this afternoon and will stay with me until Sunday. Alison continues to show a lot of emotion in her face with laughs and cries in response to whatever's happening at the moment. Over the weekend we'll continue to help her progress but she won't have any actual therapy sessions. 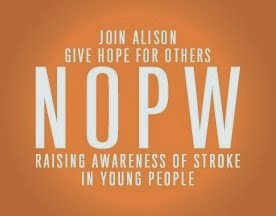 As we near our first weekly review with insurance on Tuesday, please pray that wherever Alison needs to be to continue to recover would be made available. Thanks for everything you all continue to do for us.